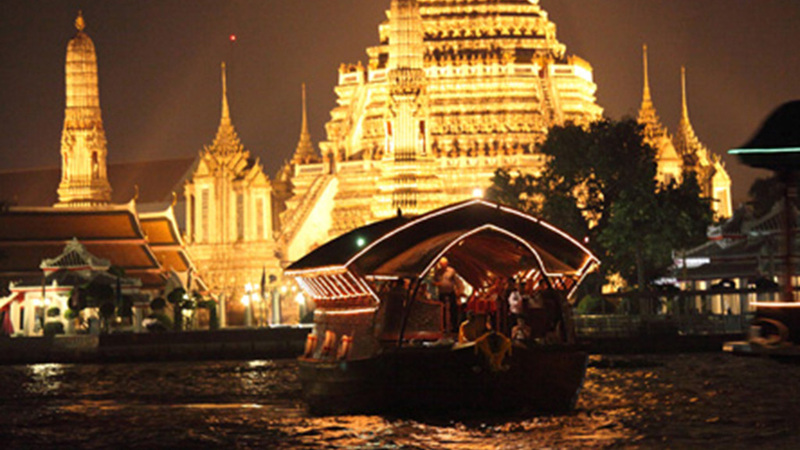 Loy Nava is the most authentic and stylish Dinner Cruise Bangkok. 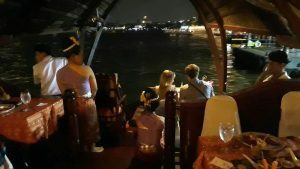 Unlike the huge touristy Bangkok dinner cruise boats that lurk in the Chao Phraya river at night carrying hundreds of guests, Loy Nava is basically a small & authentic restaurant on a boat. The vessel is a very charming original rice barge (75 years old) converted for the purpose and well maintained. It has a very romantic and relaxing atmosphere. Loy Nava Dinner Cruise Bangkok runs twice a day allowing to choose between Sunset Cruise and Evening Cruise. On board of Loy Nava Dinner Cruise Bangkok there are 17 tables that accommodate a maximum of 65 guests, nothing more than a small restaurant. The staff on board is comprised of several polite and well-trained waiters who are attentive to the service and speak good English, along with some traditional Thai dancers & music player. 4 Alcoholic Drinks – 1 Mai Tai, 1 Glass White Wine, 1 Glass Red Wine, 1 Small Glass dessert wine. 5 Premium Alcoholic Drinks – 1 Cocktail (any kind incl. “Champagne” cocktail), 1 Glass Premium White Wine, 1 Glass Premium Red Wine, 1 Small Glass Premium Dessert Wine, 1 Glass Liqueur. Enjoy a very special romantic candlelit dinner on the separate table on the boat front, surrounded by flowers, twinkling lights and the dulcet tones of our traditional Thai khim music. Begin your trip with a Honeymooner’s cocktail while savoring the Royal Thai menu. Your meal is accompanied by a bottle of fine wine to savor, as you cruise by all of the historic sights of Bangkok. A special honeymooner’s dessert and a digestif conclude your unforgettable Bangkok Dinner Cruise. Loy Nava Dinner Cruise Bangkok offers a choice between 3 different set menus available, either Thai Traditional Menu, Seafood Menu or Thai Vegetarian Menu. Important to note is that these are “degustation menus”, rather than having just a couple of dishes in larger portions there are many different dishes in smaller portions, allowing the chance to taste several traditional Thai dishes in one single occasion, for an outstanding dining experience. Each menu is comprised of 6 appetizers, 1 soup, 5 main courses, 6 desserts per person (400 gms primary foods – meats &/ seafood per person). All the food is freshly cooked on board in the kitchen located in the lower deck following rigorous hygienic standards. All ingredients are of top quality. Soup Pak (Soup of seasonal Thai Vegetables) OR Tom Yam Goong (Mildly Spicy Shrimp Soup with young Coconut) at choice. Pat Pak Roo-am Mitr (Stir Fried Vegetables in Oyster Sauce). Pick up at your Bangkok Hotel (time depending on location) or meet at the pier. 18:00 / 20:10 hrs – welcome on board, your Bangkok Dinner Cruise starts. Enjoy the gentle 2 hours cruise along the Chao Phraya River while tasting the great food. During the cruise you will witness historical landmarks such as King Rama I Memorial Bridge, The Grand Palace & Temple of Emerald Buddha, Residence of Princess Bussaba sister of HRH Queen Sirikit, Wat Rakhang, The Temple of Dawn (Wat Arun), Muslim Mosque, Santa Cruz Church & School, Chinese Shrine.